(By Pratibhu Roychowdhury) When they call, you have to go. This time the mountains made an even bigger call. 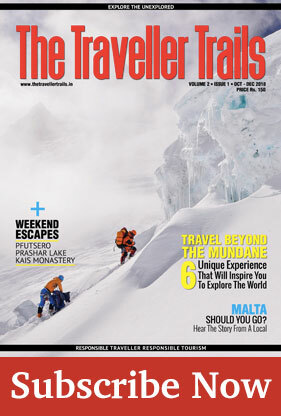 We had ten days and the entire tribal belt of Himachal Pradesh to cover. Himachal Pradesh is one of the states of India which is almost entirely in the Himalayas. The region we covered this time around started from Shimla and ended in Manali with Spiti Valley being the highlight. This was essentially a road trip covering some of most rugged mountains, high passes and raw nature in their full glory. Starting early from Shimla, we stopped at Kufri and Rampur on our way to Sangla Valley. 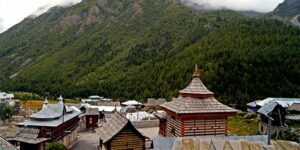 Sangla is a high valley surrounded by very high mountains. Amongst apple orchards and the Baspa river, a tributary to Sutlej, it was as picturesque as it gets. After our first night halt at Sangla, we went onwards to Chitkul, a small village further up. This happens to be the last Indian village, beyond which is the Indo-Tibetan border. The village itself is very small with a few houses which double up as homestays for travellers. The place offers different landscapes that keep one intrigued in exploring all that there is to be seen. Onwards, passing through Sangla valley again, we headed towards our next pit stop, Kalpa, another high hill station gazing into the Kinnaur-Kailash range. Wrapped in clouds through the evening, it felt other worldly. Our hotel had an amazing view of the entire range, right in front of us. Just staring at the peaks felt surreal. Nestled high atop a hill, the view was simply amazing. The morning next, we hit the road yet again. Soon, the greenery started to fade away and a more arid environment welcomed us. This was just the beginning of the raw and ruggedness of the Himalayas. We had the privilege of travelling on one of most dangerous roads in the country. Though it’s a highway, but there was barely any asphalt. With towering mountains walls on each side, and the mighty Sutlej flowing in full force through the deep gorge parallel to the road, the goosebumps were real. The stuff we were witnessing did make our jaws drop. A little further up we reach a place called Khab, a confluence point for Sutlej with its tributary, the Spiti river. After a long drive through breathtaking terrain, we reached our next stop, a small village called Nako. The prime attraction here was a man-made lake. Sparsely populated yet warmth in their hearts, we learnt about their way of life and livelihood. We had to continue as it was late afternoon already and given the remoteness of the place, we had to reach our pit stop for the night at Tabo, our first in Spiti. The winding road quickly gained very high altitude with oxygen levels and temperature both dipping just as fast. 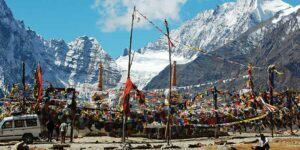 Spiti is arid and an isolated world, here is where the mountains show off in full glory. 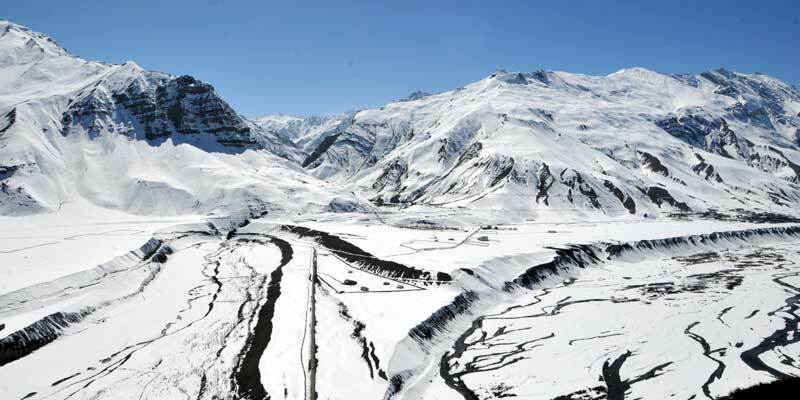 Rudyard Kipling has described Spiti as “a world within a world” in his book ‘Kim’. Soon we entered the district of Lahaul and Spiti. Being a high altitude desert, there was some grass at some places. But here is where the mountains show off in full glory. For geology enthusiasts, one could really see why Fold Mountains are so called. The road in this stretch was inhuman, but travellers and truckers seemed at ease, even through the occasional landslide hurling rocks and stones right onto our car. Late that evening we reached Tabo and checked in. Nothing much was left to do that night, but we had the Milky Way for company, literally. City life has robbed us of this ancient past time of star gazing, but here it was almost magical to see the Milky Way cluster with our naked eyes. A first for all of us on the trip. What a night! Also called the Ajanta of Himalayas Tabo Monastery was founded in 996 AD by Buddhist King Yeshe O’d. Housing some of the exquisite wall paintings and mud statues the monastery is a great preserver of the Buddhist legacy. As the Sun shone the next day, we went on to explore the village and the Tabo Monastery. Narrow village lanes lined by Buddhist prayer wheels were all around town. The Monastery itself was well maintained. 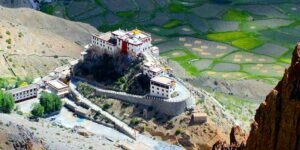 About an hour into the exploration, we retraced to our hotel and started towards our next stop Dhankar, famous for a very old Monastery, where the Dalai Lama had lived in the past. The barrenness of the place and yet how humans have conquered the odds here is something to ponder about. The Monastery situated at the top of a hill was peaceful and also provided for some good views around. We could see the Pin river meeting the Spiti river here. It was already evening when we got there, so we retired soon after. We got to stay in the newly constructed Monastery guest house. Next morning, we made a small 3 hours trek to Dhankar Lake. This lake is tucked away between the high mountains and is fed by little streams flowing into it. We sat here and spoke about life and its machinations which steal us from realizing how beautiful this planet really is. Soon after the trek, we headed towards Mudh Village in Pin Valley. 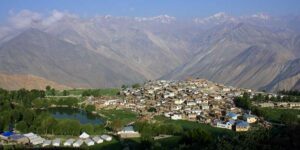 This village is extremely remote and is also the starting point for the Pin-Parvati trek from the Spiti side. The extreme rural atmosphere here with little mud houses doubling up as homestays and with an awesome view of the high snow capped mountains meant for a pleasant and rejuvenating stay. We had nothing much to do but unwind. But we ended up in a small party that the villagers had that night. Desi stuff – music and otherwise, the frivolities were real. Quite an experience! We sent postcards to our homes and moved on towards Key Monastery, the largest monastery in the Spiti valley. 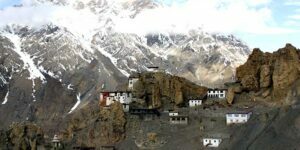 Key monastery perched on a mountain top is the largest one in Spiti valley. The Gompa is the storehouse of rare tankha paintings and several ancient musical instruments – trumpets, cymbals, and drums. Key Monastery stands on top of a small hill and is surrounded by high mountains. The barrenness of the place adds to the distinct white color of the monastery. With young monks playing football and the older ones indulging in banter, we had ourselves an enjoyable 2 hours. They greeted us with herbal tea which they say soothes nerves and makes one calm. This monastery is an important center for learning and spirituality in the region. By the time we moved on from here, evening was starting to fall. It was our last day in Spiti. Spirits were high in the evening, as we reminisced the past few days and a sense of accomplishment had started to seep in. The next day we started for Chandra Tal Lake. Something, we all have been very excited about. This day started quite early as we had a long distance to cover with very, very rough roads ahead. On our way to Chandra Tal, we had to cross the Kunzum Pass at more than 15000 ft. On the top, we stopped for a while to take photos. A treat to the eyes as usual, with several snow clad peaks around us. Chandra Tal Lake is a high altitude lake which is 6 Kms from Kunzum Pass, this lake is also known as Lake of Moon. 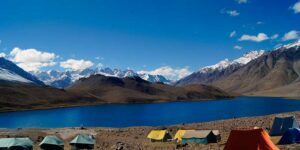 This is the most beautiful lake of the Himalayas and a great place for the campers and trekkers. This has been a major attraction of this road trip. The sheer altitudes and the high mountains have left us all awestruck. We reached the Chandra Tal campsite around afternoon and soon trekked our way to the lake. One word which everyone would utter once they see it, is “Wow”. The waters are a peacock blue all the time, and this distinctive color sets it apart from its rather brown to khaki surroundings. A tradition here is to dip your face in the water of the lake. The lake itself is in the shape of a crescent moon from which it gets the name Chandra Tal; Chandra means moon and Tal means lake. A very relaxing afternoon indeed along the shores of the lake. It was our last night in Tribal Himachal Pradesh and the day after we were supposed to start our journey back to normal civilization at Manali. The journey from Chandra Tal to Manali was as adventurous as the rest of the trip, with high mountains, intermittent waterfalls, blue sheep and other vagaries of nature. A little after Chandra Tal, we stopped at a place called Batal, for breakfast. The little shack here is run by a rather famous elderly couple, popularly called “Chacha-Chachi” (hindi for Uncle and Aunt). This couple has, over the years, saved as many as 200 lives of people who fell sick in this region due to altitude sickness or other respiratory troubles. They even have a Guinness Book Record to their names. The journey from Spiti to Manali took us about 7 hours, and through some extremely rugged terrain. Close to Manali, we had to cross the famous Rohtang Pass, a popular tourist spot. We stopped here for a while to take one last look at the high mountains, now quite a distance away, breathtaking still. We reached out hotel in Manali another 2 hours later with a permanent love for Spiti deep in our veins. This route passes through the most spectacular places in Himachal Pradesh. The journey starts from “Queen of Hills” Shimla and ends at Manali. HOW TO REACH: (By Air) Shimla Airport at a distance of 25 kms from the city center. (By Train) Shimla Railway station at 1 km from the city center. (By Surface) Shimla is well connected to other cities of North India. NOTE: Some images used in the story are captured at different times of the year. 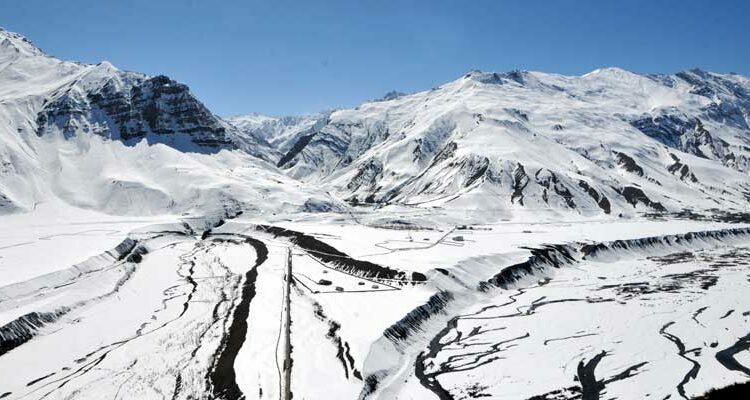 Due to heavy snow fall Spiti valley is inaccessible in winters. The recommended time to visit is mid April-mid November.